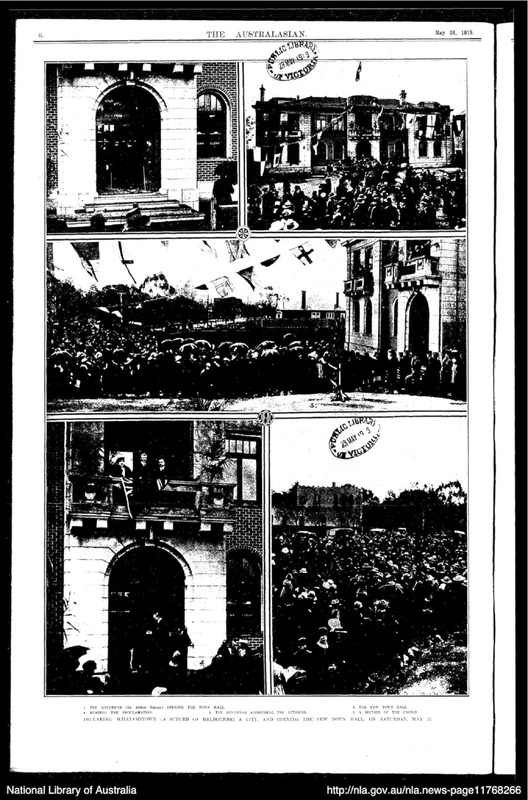 In May 1919 in front a crowd of three thousand people, Governor Sir Arthur L Stanley proclaimed Williamstown a city, declared open the newly built Municipal Building and Council Chambers in Ferguson Street and unveiled a collective photograph of local servicemen killed during the war. In 1924 a new blackwood cabinet was built to house the 265 portraits collected by Cr Henderson. Cr W. Henderson, during the past twelve months or more, has been engaged upon a worthy ‘labour of love”. At the request of the Council he has been engaged in the mission of compiling the list for an ornate honor roll, that of local soldiers who fought on the battlefields of Gallipoli, Egypt or France, and mayhap had laid down life itself for his love of country. And of these there have been no fewer than 225 out of some 1800. The Council intends to have a collective photograph of considerable dimensions. With the exception of one or two instances Cr Henderson believes that he has accomplished this set portion of his task. He has made the gathering of these personal pictures a special duty, and in some instances has been to a great deal of trouble and has had to explore very far afield to bring his quest well within the region of accomplished fact. 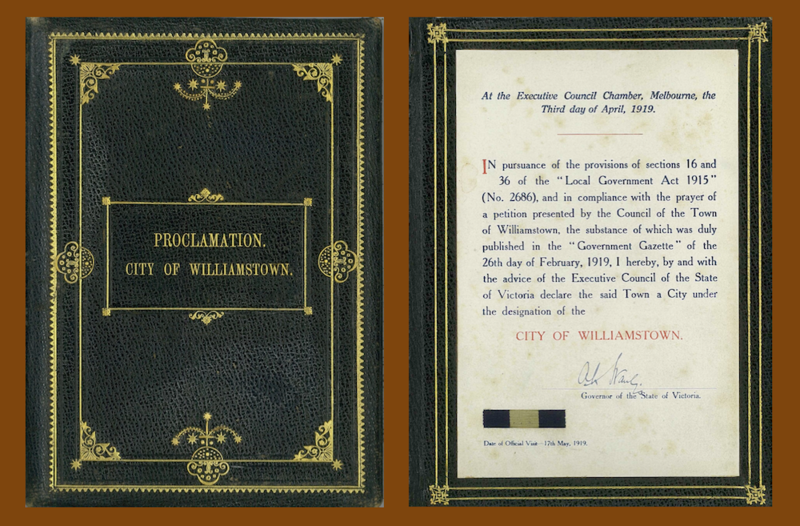 In May 1919 in front a crowd of three thousand people, Governor Sir Arthur L Stanley proclaimed Williamstown a city and declared open the newly built Municipal Building and Council Chambers in Ferguson Street. Williamstown on Saturday, entered upon a new phase in its history, when the dignity of being proclaimed a city, was conferred upon it by Sir Arthur L. Stanley, K.C.M.G., the State Governor. At the same time was performed the official opening of the municipal offices, succeeded by the unveiling of the collective photograph of local sailors and soldiers killed during the war. 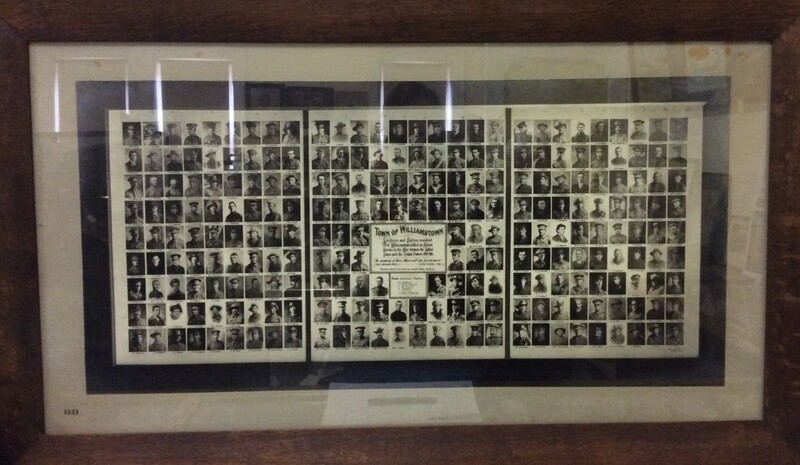 An ‘8 feet by 4 feet handsomely framed and glazed collective photograph’ of the local servicemen killed during the Great War. The Governor made a feeling address before unveiling, the photograph. He said it was a very appropriate memorial with which to recall the gallantry of those who had lived so long in Williamstown and had been fated never to return. Their memories would be revered by every loyal man and woman in this city, for these men had lost their lives upholding a great ideal. William Henderson, a Williamstown Councillor from 1916-1928 and Mayor from 1919-1920 collected the portraits and information that went into making the 1919 collective photograph. This piece was made up of 248 individual photos plus the names of 6 other local servicemen who died. 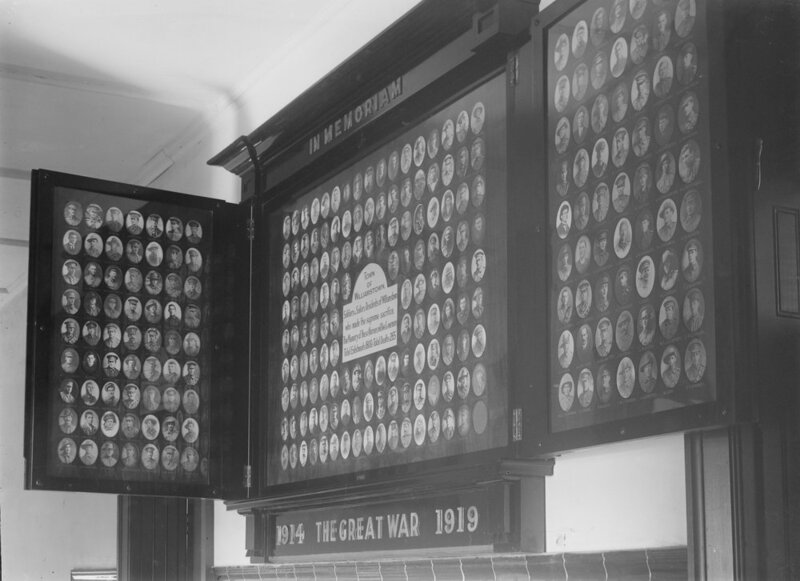 We believe that collective photograph may have been the first manifestation of the present honour board which hangs in the Williamstown Town Hall today. Cr Henderson was highly committed to gathering the photos, it was to be his labour of love, but he found it no easy task. PRESENTATION TO CR. 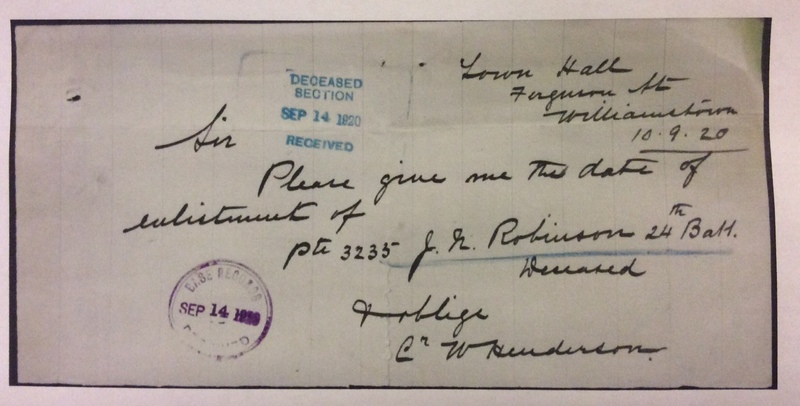 HENDERSON, SOLDIERS’ MOTHERS’ GRATITUDE. The experiences he had gone through in getting these photographs had been an education to him. He had seen more of the domestic side of grief than he had done before. In visiting families Cr Henderson had learned the private histories of those boys so truly loved. 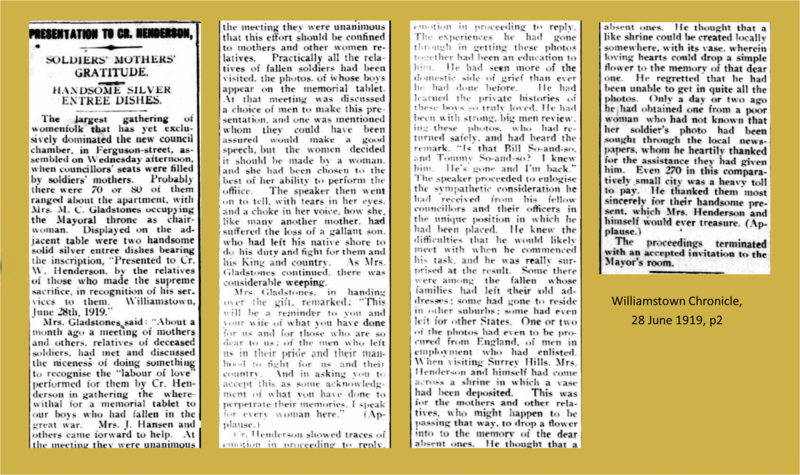 Mrs Gladstones, in handing over the gift remarked: ‘This will be a reminder to you and your wife of what you have done for us and for those who are so dear to us: of the men who left us in their pride and their manhood to fight for us and their county. And in asking you accept this as some acknowledgement of what you have done to perpetrate their memories, I speak for every woman here. Click photo to make bigger. Please give me the date of enlistment of Pte 3235 J.N. Robinson 24th Batt. Deceased. By 1924 Cr Henderson had collected a total of 265 portraits of Williamstown, Newport and Spotswood men who had perished in the war. 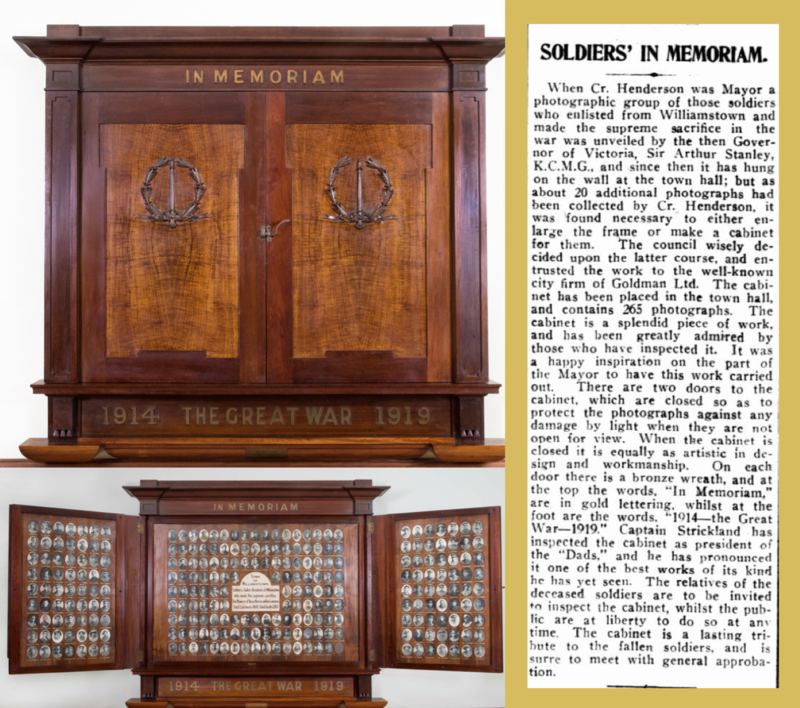 To display them the council contracted the well-known Melbourne firm, H Goldman Manufacturing Co., to build a blackwood cabinet with doors designed to protect the photos against light damage. We believe that the original collective photograph unveiled in 1919 may have been the source for some of the photographs used to create the 1924 honour board.